During this year's Valentine occasion, allure the heart of your precious one by presenting the person this Spiritual Hypnotization Valentine’s Day Rose Cluster and crave a pleasing niche in the individual's heart. This neat Round Basket is dressed up with 20 virtuous Red Roses and sprouting Green Fillers. Note: The Design of the Basket may vary depending on availability. 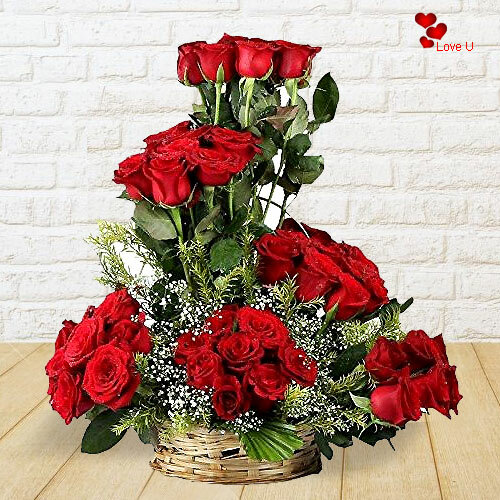 Flowers Delivery Patiala, Send sweets Silvassa, Wedding Cake Solan, Diwali Mithai Udaipur, Send Flowers and Gifts to Bikaner, Online Shop Panaji, Flower to Jamnagar, New Year Flowers Jalgaon , Fresh Fruits Bikaner, Send Gift Gopi, Dry Fruits to Thrissur, Birthday Delivery Ranchi, Sending to Chennai, Flower shop Sivakashi, Udipi Online Cake Delivery.